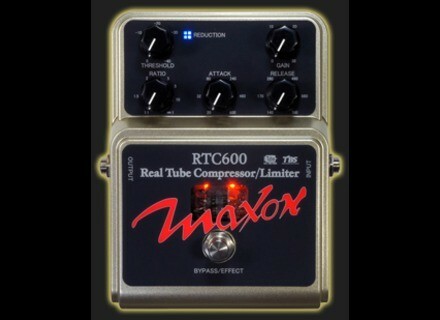 RTC600 Real Tube Compressor, Compressor/Sustainer for Guitar from Maxon in the Real Tube II series. Godlyke announces release of Maxon Real Tube II Series analog tube effect pedals. 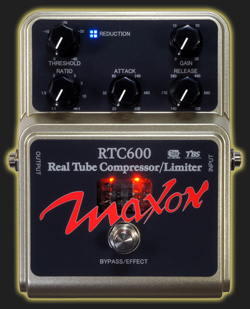 Maxon is retiring their Real Tube Series models RCP660, ROD880 and ROD881. Replacing these veterans is the Maxon Real Tube II Series. The RTC600 Real Tube Compressor, RTO700 Real Tube Overdrive and RTD800 Real Tube Overdrive/Distortion feature analog technology designed to couple vacuum tubes with a compact floor effect. Tube Compressor/Preamp in a stompbox format. The RTC600 uses a RMS level Detection circuit and VCA to create a compression sound with low noise floor, according to Maxon. Pre-Compression tube placement designed to add classic valve warmth. In-Rush Current control heats tube at low voltage. Internal charge pump runs circuit at 25 volts, designed to provide headroom and full-range frequency response. Can be used at amp’s front end, placed in an effects loop, or used as an outboard processor for home recordings. Variable Threshold control between 0-40 dBu selects level at which the compression begins. +30 dB of clean Gain designed to allow user to match effect and bypass levels or use as a clean booster. Variable Ratio of 1:1 thru 1:∞ allows user to control the amount of compression effect. Variable Attack and Release controls to fine-tune compression effect. The RTO700 offers Tube Distortion with no clipping diodes in the signal path. All distortion comes from the dual triode preamp tube and amp circuit. Post-Distortion tube placement designed to create authentic tube tone. Internal charge pump circuit bumps incoming voltage to feed the tube with 12.6 VDC. Gain and Master Controls allow the user to dial the amount of distortion and output level. Three independent Tone controls with no frequency overlap. Variable VCA Noise Reduction circuit with LED status indicator and On/Off switch. The RTD800 Features independent Overdrive and Distortion circuits combined with a noise gate and switchable boost to offer 4 separate effects in one pedal. Internal charge pump circuit designed to bump incoming voltage to feed the tube with 12.6 VDC. Variable VCA Noise Reduction circuit, which features an LED status indicator and On/Off switch. Independent and selectable Overdrive and Distortion modes with different clipping configurations. Foot switchable Boost function that can be varied between 3-9 dB via an internal trim pot. Check out www.maxonfx.com for more details. Burriss Boostiest 2.5 Burriss Amps introduces the Boostiest 2.5, updating the look and performance of their Boostiest II stompbox. Fishman LoudBox Artist LBX600 Introduced at Summer NAMM 2011, the new Loudbox Artist represents a design evolution of the Loudbox 100, with the same brown and cream look as the successful Loudbox Mini. . Radial Engineering X-Amp Reamper Radial Engineering announced the Radial X-Amp 500 series Reamp, a device designed to simplify the reamping process in the studio.